As the spring days get warmer and evenings stretch out, it’s not all that appealing to spend an hour in the kitchen preparing a big meal. So opt to limit your time in the kitchen by whipping up these easy savory salads. These three colorful alternatives to a big meal don’t even require that you mix up a dressing. 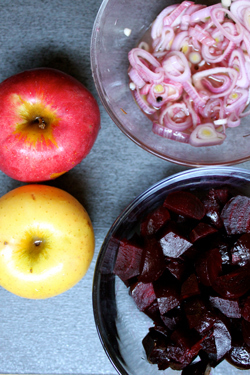 Pickled shallots lend a punch to roasted beets and show that you don’t need greens to make a gorgeous salad. The earthiness of the beets is punctuated with creamy, salty feta and sweetness from a few of last fall’s lingering apples. Strawberries balance the bite from balsamic and the spicy Asian greens. Slaws may be the easiest of all salads, and this one made with carrots, scallions and lime juice is no exception—even as you quickly caramelize sunflower seeds with a salty slick of soy sauce. Preheat oven to 375 degrees. Wash beets, and trim scraggly stems and roots. Arrange beets on a sheet of foil and drizzle with olive oil. Crimp foil edges together to seal the beets in and roast (45 minutes to an hour, depending on size) until beets can be easily pierced all the way through with a paring knife. While beets roast, heat brine ingredients in a small saucepan until it comes to a simmer. Pour brine over shallots in a heatproof bowl and massage together. When beets are tender, remove from the packet and allow to cool enough to handle. Once cool, peel and quarter. into chunks the same size as beets. In a large bowl, combine beets, apples and feta. Remove peppercorns from the shallot brine and add them, along with any remaining brine, to the bowl with the beets. Toss together, drizzling with olive oil to moisten the mix. Wash remaining beet and quarter it. Slice thinly and sprinkle pieces over top of the salad. Wash, slice and toss strawberries in a small bowl with a tablespoon of balsamic vinegar. Set aside. While strawberries macerate, wash and dry greens and add to a wide, shallow bowl. When ready to serve, crumble goat cheese, salt, pepper, strawberries and any accumulated juices over greens. Drizzle with olive oil, toss gently and serve. In a wide frying pan over medium heat, toast sunflower seeds until lightly browned and fragrant. Remove pan from heat and add soy sauce, stirring seeds constantly until all moisture has evaporated and seeds appear coated in the soy reduction. You may have to return the pan to the stove over low heat to continue cooking until all moisture has evaporated. Using either a box grater or a food processor with a julienne blade, grate carrots into a fine shred. Wrap grated carrots in a clean kitchen towel and wring out some of the moisture. 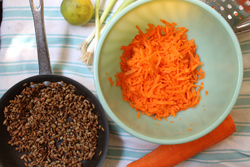 In a large bowl, toss carrots with the lime juice, half of the sunflower seeds and half of the sliced scallion. Add mixture to a wide platter and top with remaining scallions and seeds. Emily Teel is a food freelancer dedicated to sustainable, delicious food in Philadelphia. See more of her work at emilyteel.com.